in Europe,' has long been one of Vladimir Putin's strongest allies. that all of the former Soviet Republics fear who might be next. Ever since Russia's takeover of Crimea, the eyes of the world have been on Alexander Lukashenko, hardline president of Belarus and ally to President Vladimir Putin.. According to this report from the state-run Belarusian Telegraph Agency, Mr. Lukashenko is refusing to retract his opposition to Putin's Crimean venture. Lukashenko warns the West of what other CIS countries might do, and says the annexation of Crimea will likely have dire consequences. 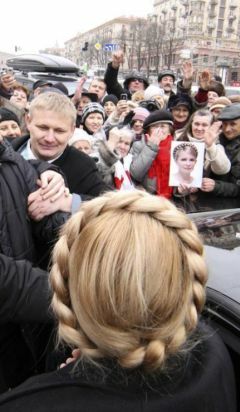 Prime Minister Yulia Tymoshenko is crushed by admirers who protested for her release, Feb. 28. Tymoshenko is likely pondering another run for the presidency after seven years behind bars. She is just another ingredent in the volatile atmosphere of today's Ukraine. MINSK: Crimea is now part of Russia, and recognition or non-recognition of the fact changes nothing, Belaruse President Alexander Lukashenko told reporters Sunday. “Crimea, like Ossetia, Abkhazia, and other regions, is not an independent state. Today Crimea is part of the Russian Federation. Whether you recognize it or not, the fact remains,” said the Belarusian head of state. "Belarus has declared its position on the matter [it is opposed to it]. Some say our position aims to avoid confrontation with either of the two states [Ukraine and Russia]. But Belarus is not going to confront anyone," the President said. Alexander Lukashenko emphasized that, “no one is demanding that Belarus recognize Crimea and support Russia, or take a stand against it. ... I will tell you honestly: no one demands it from me, from our government, or from the Foreign Ministry,” the Belarusian leader said. “We aren't going to meddle in it. ... It is bad that the Russian Federation had to resort to these measures,” Alexander Lukashenko said. The president also warned of the possibility that a wave of self-determinations could now begin, which he said would be dangerous. "As for the wave of self-determinations, many hands have begun itching, but as Viktor Chernomyrdin once said, they have begun itching in the wrong place," President Lukashenko said. [Chernomyrdin was prime minister under President Boris Yeltsin]. Mr. Lukashenko said that in asking this question, journalists had drawn him into a discussion on very serious issues, particularly on precedents. "I would tell the West that Crimea is dangerous, but not because it became part of Russia. Precedents are important,” Alexander Lukashenko said. 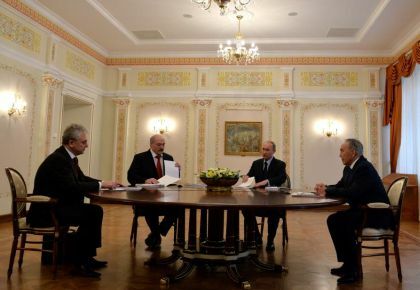 The president recalled signing the Budapest Memorandum on Security Assurances. "I had to sign this shameful document in the presence of the British prime minister [John Major], Bill Clinton and Boris Yeltsin, when our “great political leaders” decided to remove all of our nuclear weapons, without any preconditions, free of charge. Ukraine and Kazakhstan did the same. Back then, three states - Russia, the United States, and the United Kingdom, assured us of economic security, political and territorial integrity and all other things,” he said. "This is dangerous. Some states have withdrawn, and Ukraine has said it, too, is withdrawing from this agreement. States on the verge of production are getting off the nuclear leash. The consequences could be ... terrible. 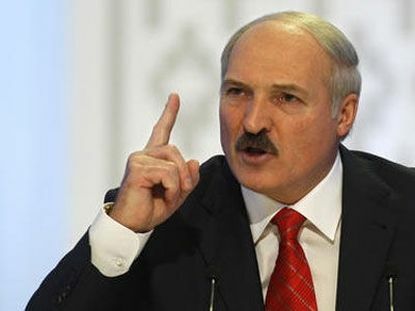 A bad precedent is being set,” said the Belarusian leader. "It is bad that small- and medium-sized states have begun to think they can't protect themselves and maintain their territorial integrity. A wave of self-determinations could begin - and this is dangerous. One might think, if you can hold a referendum and resolve the problem, why not?” the president noted. "I think it is one thing to discuss the issue hypothetically. Time will tell what will happen," he added. The president expressed hope that Ukrainian politicians and those with influence in Ukraine will manage to prevent the country from an ill-considered withdrawal from the CIS. Moreover, Mr. Lukashenko said sees no reasonable explanation for Ukraine's decision: “Why would they withdraw? Is the CIS so binding on Ukraine? Why to rush? If you don't want to attend the summit in Moscow, for example, if you think Moscow is your enemy, don't go there. But let your ambassador represent you. If you don't want to go to Minsk, if you hate Minsk, don't come to that summit,” he continued. The president compared Ukraine’s decision to withdraw from the CIS to another recent decision - to ban the Russian language in Ukraine. “I think this decision by Ukrainian policy makers would be misguided, irrational and unreasonable. Why not use the CIS platform to voice your position and get your message through to other states?” the president asked. He said he is convinced that this would be a very misguided, hasty, and ostentatious move by the Ukrainians. President Lukashenko said that he would certainly share his views personally with the Ukrainians. “I have invited Ukrainian politicians to discuss the issue. I hope we meet in the near future,” the president said. According to him, Ukraine’s withdrawal from the CIS would be painful, and fail to deliver a death blow to the CIS, because unfortunately, people already know not to depend on it. “If Ukraine withdraws from the CIS, let it be. The remaining countries will continue cooperating the best we can,” Alexander Lukashenko said .